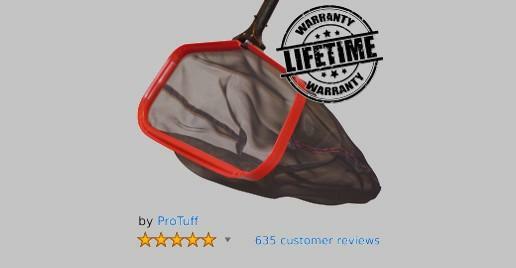 Deep, durable and abrasion resistant, this pool leaf rake bag maintains it’s integrity and handles big swimming pool clean-ups with ease. Medium mesh size for quick collection of leaves, insects & large debris. Won’t bend or break under load. Tightly secured within “winged” handle for additional stability. Safe for all types of pools. Will not mar or scratch pool surfaces. Scoop front for easy leaf pickup from pool bottom. Straight sides with slight angle for easy cleaning of pool sides. If any portion of your swimming pool leaf rake ever breaks, fails or tears, simply contact us for a FREE (no shipping expense) replacement part or a complete replacement of your rake. Deciding if a ProTuff Pool Leaf Rake is Right for You? Medium Mesh Net – Fine mesh leaf bags grab silt from the swimming pool bottom & small debris from the surface, but they “push” alot of water & are hard to pass through the water. This “water pushing” action means more muscle strain for you AND it moves leaves & such AWAY from the net, making it hard to catch large debris. Coarse mesh nets grab large debris like leaves & insects and pass through water more easily, not “pushing” the water. So, larger, lighter debris is NOT pushed away from the net & there’s less physical strain for you. Sturdy Nylon Net – A sturdy, nylon net is less likely to develop holes and collects large volumes of debris without much strain. It won’t pass back “through” the rake frame, allowing the contents to spill out. No wasted time re-bagging “lost” debris.Soft, flimsy nets develop holes easily & are more likely to accidentally “dump” debris back into the pool. But, they’re easier to empty. Sturdy nylon nets must be emptied by hand, rather than simply shaking them out. It’s still easy, but a bit less convenient than simply shaking them out. Plastic Coated Aluminum Alloy Frame – Aluminum frame leaf catchers are slightly heavier than plastic, but handle more weight. So, you can collect more debris faster, resulting in less time pool cleaning. They cost more though, so, if you can’t afford it, consider an all plastic model. Straight Angled Sides – Curved sides won’t scrape debris from the pool-side very well. Straight sides ride flush against the pool-side to remove stuck on leaves. Medium Sized “Mouth” – Narrow mouth frames cover less area. Wider mouths collect more debris, but are heavier to lift from the pool. A “happy medium” is an 18 – 20″ wide frame. 24″ if you’re strong, have a huge pool & are in a rush. 16″ if not so strong, have a tiny pool or don’t mind a long cleaning session.